I'm now stuck with writing a piece of code to look up individual pixel values on a raster image. This piece of code mainly executes two tasks: (1) converting world coordinates to raster coordinates (I use a package named "Affine" to do that); (2) then computing pixel offsets and figuring out which column and row the pixel is located at. The major problem I'm facing now is that the code didn't return the correct column and row that the pixel is located at. GDAL has all tools on board to read the data. The steps howto read data can be found in http://www.gdal.org/gdal_tutorial.html section read data. The routines GDALRasterIO or in python band.ReadRaster at least will do the job in conjunction with the inverse-pixel-to world-transformation given by GDALGetGeoTransform (parameter of the transform) and calcWorldToPixel. LAYOUT: WxHxB is 14946x11192x3 Bands found! I use the both transformation forms based on the parameter arrays given by GDALGetGeoTransform and calcWorldToPixel is the interesting one. And retrieve the data with GDALRasterIO in Python (band.ReadRaster(..)). In C I've to distinguish the data type of the bands only done here for GDT_UInt16. At least print the result. I rewrote your code again to avoid unnecessary lines and to express coordinates as points. I tried out it with my particular raster (utah_demUTM2.tif) and it works perfectly (see next image). 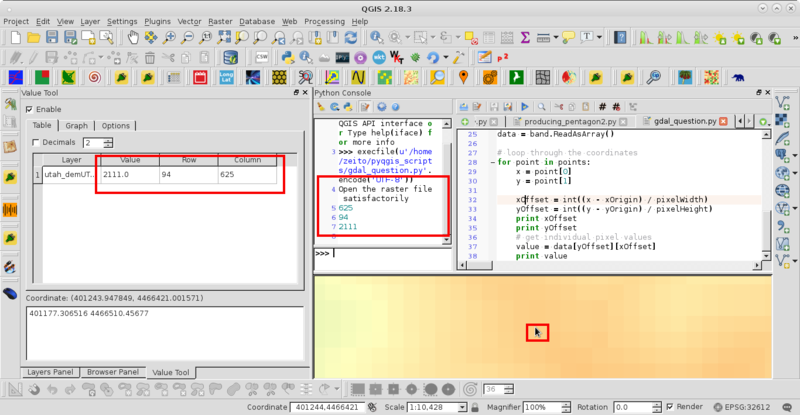 After running the code at Python Console of QGIS, I corroborated printed results (value, xOffset, yOffset) with raster value, by using Value Tool plugin, and they matched. Alternatively you can use rasterio, which has a sample() method. Not the answer you're looking for? Browse other questions tagged python raster gdal or ask your own question. Getting pixel value of GDAL raster under OGR point without NumPy? How to get X Y coordinates and cell value of each pixel in a raster using Python? How to add color interpretation for raster bands using GDAL? GDAL/proj4 equirectangular projection coordinate system units assumed by OGRSpatialReference and GDALDataset::GetGeoTransform()?